Today I went out to watch other people run the Oslo Marathon . It's a big event. In 2010 it attracted 16,000 runners, more than half of them women. People came from all over the world. It's a beautiful course, winding along the edge of the Oslofjord and then up into our sparkling city. Jonathan and I live about three blocks from the middle of the course, so we walked over to cheer the runners on. Running is not second nature to me. It's not even natural. My gait isn't graceless or anything. I played sports for too many years to be clumsy when I run. It's just that my lungs, my heart, my mouth, my thighs, my calves, my feet, my knees, my arms, my hands, and my ponytail can't seem to find the appropriate harmony when I try to use them all at once. Believe me, I've tried. 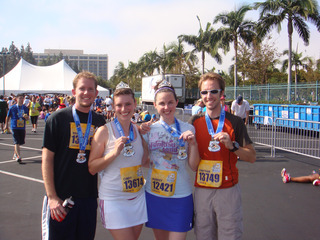 Jonathan and I have completed the Disneyland Half Marathon twice, first in 2008 and then again in 2010. 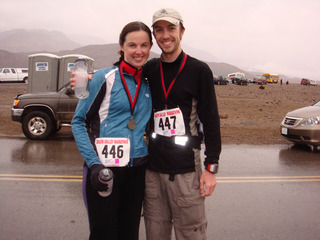 We also ran the Death Valley 30K together in a record rainstorm, and Jonathan had an injured knee that time, so we basically walked the last half of it. 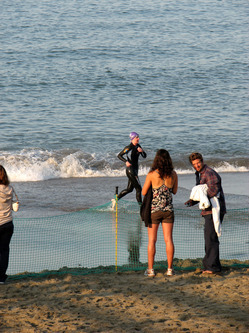 I've also done a sprint triathlon with the Mermaid organization in California, an event which required me to face my fear of sharks and swim out around a pier in Santa Cruz (and making excellent time, I might add, due to that fear). After the swim, I biked 11 miles and ran the final 2.5. I dragged myself over that finish line, my skin a vibrant shade of pink blotched with red. Throw in a couple of 5K races and the weekly timed miles in my high school P.E. class and you've got the grand total of my life as a runner. But it all seems like so long ago. And unfortunately, being able to point back a year or two and say, "See? I ran that once. I went from here to there. Not very fast, mind you, but faster than if I'd walked it," well, it stops being satisfying after a while. The start time for the Oslo 10K had been 9:40 a.m. When we arrived at the part of the course closest to our place, the stragglers from that race were huffing and puffing their way up Karl Johans Gate, the long pedestrianized street which runs from Oslo Central train station uphill to the grand, yellow royal palace. We watched people of all ages, all sizes, and all levels of skill as they rounded that turn. Most were dragging their feet, sweat thick in their hair. Some were limping over muscles strained somewhere earlier on. These were the survivors. I knew they'd finish. Give them another hour or two and they'd barrel stiff-legged over the line. Victorious, but pained, haggard, battle-worn. I've been there. If I were to attempt a half marathon now, having not run seriously in over a year, it's how I'd look and feel. That's a tough truth for someone who likes to think of herself as healthy. The start time for the marathon had been 10:15 a.m., so we had a while before the elite runners made it to what I'd begun calling "the palace turn" in my head. I bought a chocolate croissant and took flaky bites of it as we walked a straight line down to Aker Brygge, the spot along the water where we would see runners who were farther ahead in the 10K. Along the way we passed the massive white tents set up for the finishers. Volunteers were handing out waters, Gatorades, bagels, and bananas. Trash cans overflowed with discarded bottles and wrappers. Men and women in shiny spandex stretched out over picnic tables, some looking dazed and exhausted, others looking rosy and optimistic. After all of our races I remember smiling. I remember holding my arms up over my head like Rocky in the ring. But I don't remember any of the details. People handing me towels, water, placing my finishers medal over my head and around my neck like a lei. I don't remember volunteers stopping me to cut the chip tag off my shoe. It all happened. We have photos of it happening. My smile is there, just as I recall, big-lipped and wild. My eyes aren't focused on anything in those pictures , though. The sheen of sweat on my forehead, cheeks, clavicle, looks a little foamy. Like someone ought to have me lie down under a blanket with ice packs on my chest and inner thighs. But no one can dispute how happy I looked, how happy I was. The race route was taped off in places to keep people from tripping up the runners. A group of them pounded up on approach. Spectators hooted and howled, clapping their hands. Like so many things in Norway, the cheers seemed familiar but slightly off. Where Americans might holler, "Woohoo!" or "Hooray!" or even "Yeah-yeah-yeah-yeah!" the Norwegians all fall into a cheer of, "Oy-yah! Oy-yah! Oy-yah!" Hearing the cheers, the runners perked up as their feet slapped methodically on the pavement by the piers. Some waved. Some smiled. All of them continued on. We headed back to the palace turn to watch for the leaders of the marathon race. We stationed ourselves in the middle of Karl Johans Gate, looking southeast for our first glimpse. Focused. They moved with chests high, shoulders relaxed. The pumping of their arms served only to gather and release momentum, the rods connecting the wheels of a steam engine. These were the elite runners. People who had done all this before. It was impossible to tell whether they were on Mile 7 or Mile 17. As they passed us, they didn't react to the crowd, to the clapping and chanting of "Oy-yah, oy-yah, oy-yah." They came in ones and twos, spaced by full minutes. "How fast are they going?" I asked, but Jonathan wasn't sure. It's hard to tell about speed without a GPS strapped to your own wrist. The first elite female runner approached. She was young, the muscles in her arms, legs, and abdomen taut and visible under her flushed, pale skin. I marveled at the way she kept her body still, as though it glided above her legs as they spun. Her shoes barely seemed to touch the asphalt. And then she was past me, her blond ponytail bobbing evenly in her wake. Blue Kinesio tape curved up over her hamstrings, disappearing beneath black spandex. A while later we saw the first pace setter approaching. He ran at the center of a large pack of runners, mostly men. Behind the pacer bobbed an enormous orange balloon with his pace written on it in bold, black numbers: 3:00. This group, if they managed to stick to the current pace, following the man with the balloon, they would complete the marathon in 3 hours. Considering that my half marathon time is more than 3 hours, I find that pretty impressive. As usual, Jonathan did the math. "They're running at more than 8 miles per hour," he said as they whipped by our post. "Of course, that doesn't mean anything to us, really. So if you convert it to pace, they're running at a mile-time of 6 minutes and 52 seconds." I nodded. Sure. Sub-seven minute miles wouldn't break any world records, but still. "I could do that pace," he added. "For about one mile." I laughed and said, "And my fastest mile time ever was 7:10." "Yeah, but I was fourteen, and in the best wind shape of my life." Wind. It's something I've always struggled with. I opted for sports that didn't require high levels of endurance. Basketball was closest, but so much of that conditioning was about speed. Volleyball, my favorite sport, required strength, agility, muscle control, but I didn't run a lot in order to train. Only when I swam did I learn the importance of deep, sustained breath. I was a varsity swimmer at fourteen, and that year I ran my fastest mile in P.E. Coincidence? Probably not. But I didn't care to run. Cross-country would have pulled me from volleyball, my one true love beyond writing. Jonathan ran track in high school. He's built to do the long races, lithe and controlled. I wish he could do these things now with more consistency, but his knee flares up too often. He injured it on a training run for the Death Valley race in 2009. We were doing hills at a local park. I'll never forget the way his face crumpled in pain as he grabbed for his knee, lurching to a stop in the gravel. We stood together, shocked. The road was damp and quiet. When we tried to get going again, he shook his head in firm defeat. He couldn't go on. He was not invincible. And neither am I. Eighteen months later, as we trained for our second half marathon, I felt my knee twang with pain. Nothing was swollen. It responded to ice. But the pain was acute enough to bring me to an immediate walk out of nowhere. 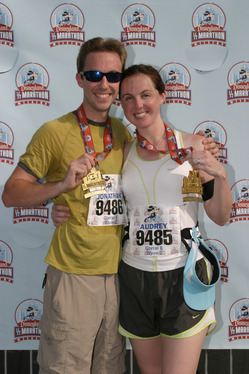 As a result, our second half marathon time was slower than the first, something I had never anticipated. 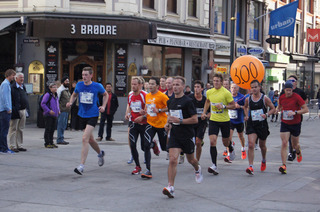 The Oslo Marathon course wove through the city streets. Trams and bus lines were canceled or rerouted. Walking only three blocks, we came across three different parts of the course. Along the way, we cheered and took pictures. The weather had cleared from a veil of overcast clouds to a bright blue sky, a cool breeze whipping at the red, white and blue flags atop the buildings. The runners relaxed on the downhill, shoulders shining in the sunlight. They were on their way to a goal they were prepared to meet. It's the feeling I do remember, even as the details remain blurred by my fatigue on those race mornings. I remember pride lifting me up. I remember knowing for certain that my lungs and legs were stronger than they had been before. I had been committed to my goal, and then I achieved it. On my own. Alongside the man I admire most in the world while he was accomplishing the same thing. And we'd spent hours on the open road together, talking and letting our feet carry us along to the same rhythm. As we turned away from the course this morning, I knew what I wanted: to have all those things again. Once more. So, I want to commit to this now. I will participate in and complete the Oslo Marathon in 2012. Barring injury, of course, and I will do anything in my power to avoid that. It's a simple idea, really, because running is so simple. Point A to Point B. Then I'll be able to point to the race and say, "See? I ran that." And I will be satisfied.